Please complete the booking form and forward it with deposit of £6 (which includes £1 holiday cancellation and comprehensive insurance premium) to Arrowsmlth Head Office or any of their agents. A completed booking form is necessary and all questions should be fully answered. You will normally receive written or photostat confirmation direct or through your travel agent (if booking through him) within three weeks of Arrowsmith receiving your formal booking. If special hotel or air arrangements are necessary this confirmation may take a little longer. An itemised account showing the balance amount remaining is sent to each client and/or agent 3 to 8 weeks before departure and should be paid 14 days prior to departure. This is based on twin bedded or double bedded rooms. Singles are very limited, and if available are charged extra at 5/- per night. Rooms with bath or shower, balcony or terrace, toilet, etc., are also charged extra, unless hotel description states otherwise. In all cases when requested, every effort will be made to provide, but no guarantee whatsoever to provide can be given, even though a supplementary charge may have been paid and accepted in good faith. When facility is not received any extra cost paid would of course be refunded on request after return from holiday. In deciding the suitability of a hotel or pension for your purpose, the price quoted by us is the best guide to its standard. Thus in Spain and Italy for example the modest priced normally offer local food and dishes often rewarding to the palate when tried. The more expensive can usually offer a near international cuisine — English food prepared, cooked and served as such should not be expected — after all, you will be in a foreign country where customs and habits will be different. The fun in going abroad is in such things. The price can also reflect differences in other ways — relative positions to beach and town; more or less rooms with bath or shower, with or without lift, garage, central heating, lounges, bars, etc. In all cases they have been chosen by us in an honest attempt to offer value commensurate with the price charged. Reduced fares are available for children 2 to 10 years of age Inclusive. The reduction is 15% for first child and 10% for second child. Reductions can be offered for only two children on any one booking. Children must be accompanied by two adults to qualify, and occupy same room as parents. We regret no reduction possible at all on departures between 4th July and 23rd August inclusive. These consist of table d’hote Breakfast, Lunch and Dinner each day. (Continental Breakfast on Continental Tours.) This applies unless otherwise stated on each itinerary page. We do not provide an a la carte service at all on these package tours. The commencing meal varies according to day or night flights and arrival times, but is usually an evening meal the first day of arrival on the Continent. The terminating meal is breakfast on the last day of departure from the Continent. For meals on Air-Coach Tours see the special paragraph on COACH TOURS this page, or on the tour page itself. Most of these items are fully covered in your inclusive cost, the exception is the 2% Tourist Tax in Spain (approx. 2/- to 9 – depending on grade of hotel). This will be added to your final account. Terms quoted do not include rooms with private bath, shower, toilet, .balcony, terrace (unless otherwise stated in hotel description). Also excluded are beers, wines, spirits, tea or coffee (except breakfast), laundry or any other item not specifically mentioned. Cost of Baggage, Insurance, Passports, Visas, Registration fees, Airport Taxes at home and abroad are not included. Passengers should note when asking for use of public bathroom, the hotel will charge extra for this service — this is common continental practice. A percentage is added to all accounts when presented by hotels, etc., abroad. These items both at home and abroad are payable by all air travellers. The amounts are small, and at the time of going to press are approx, as follows: Spain 9/10, Switzerland 5/-, Italy 6/-, France 10/6, U.K. and Ireland 7/6. These items may be collected from you by our representatives for group payment by them at point of arrival or departure; if not, payment is individual. This applies unless circumstances change before departure. Passengers leaving the U.K. either by boat or air are now only allowed to take out of the country, £15 in notes, or silver, in English money. Under no circumstances will the Authorities permit any excess of this amount. The above is at the time of going to press. These are necessary, endorsed for the countries to be visited. Passengers should make certain that their passports are in order for the tour booked. This should be attended to in good time. If you are unable to travel due to passport difficulties, substantial cancellation fees may be involved. This is not included in the tour cost. Air passengers have coach transport provided from terminals to Airport and return, but the small cost is additional and should be paid during the journey or on request. Clients should note that Arrowsmith staff are not on duty at U.K. departure or arrival points. All clients are, however, met on arrival in Eire or on the Continent. By Boat, terms include 2nd class ticket. By Air, travel is by our Charter Service 1st class boat travel is possible, extra cost is £2 13 0 Liverpool-Dublin and £2 3 0 Holyhead-Dunlaoghaire. Air passengers can fly regular scheduled services B.E.A. or Aer Lingus as an alternative, or when charter planes are full. Extra charges to be added to the appropriate air rate quoted on tour pages. All rates are based on current prices at time of going to press. One bag, approximately 30 ins. x 16 ins. x 9 ins. and weighing no more than 30 lbs. (which cannot be exceeded) is carried free of charge when travelling by AIR-CHARTER. We wish to emphasise and make it clear that baggage and personal effects are carried entirely at owners’ risk. We do not accept any responsibility whatsoever for any loss or damage to passengers’ personal luggage or effects even though handled by Arrowsmith servants or agents. This applies equally to delay In clients’ receipt of luggage, before, during or after holiday. It is strongly recommended that clients insure their luggage for the duration of the holiday. The cost is small and can be arranged through Arrowsmith, their agents, or clients own channels as desired. Changes in holiday arrangements by clients involve considerable clerical work. A fee of 20/- is, therefore, charged if an amendment is possible. This is, however, without prejudice to any financial debit client may have on the tour originally booked. Transfers to alternative holidays, within 12 weeks of departure, are treated as cancellations and new bookings with new deposits are payable. There is nothing about the Travel Allowance or V Form amounts which need adversely influence you in the least about taking your Continental holiday this year. It is all simply explained for you on page 3 and, additionally, the V Form amounts are individually quoted for every Continental holiday and hotel on pages 74-77. May we emphasise again there is nothing at all extra to pay this year from any other year, nor do you have to take the full spending money amounts available if you don’t wish. If you are still puzzled by it all, ask us or any of our agents to explain verbally; we shall both be pleased to assist in this way. These will be forwarded to client’s or agent’s address after payment of balance and usually to arrive one week before departure. Special luggage labels are provided and it is important that passengers use these for easy identification by our staff. These are provided free but as meal packs or tray meals, as is the case with most Air Charter Companies. They are modest in their content of necessity in relation to both price and physical limitations of the aircraft. In any case they are only provided when the flying time approximately coincides with a normal meal time. Thus meals are not usually provided on the outward and inward leg of a night flight. On the shorter routes the flight time is a limiting factor and meals are not served. Coffee and biscuits are, however, usually available. Such routes are to Ostend, Dinard, Bordeaux, Basle, Biarritz and Munich. 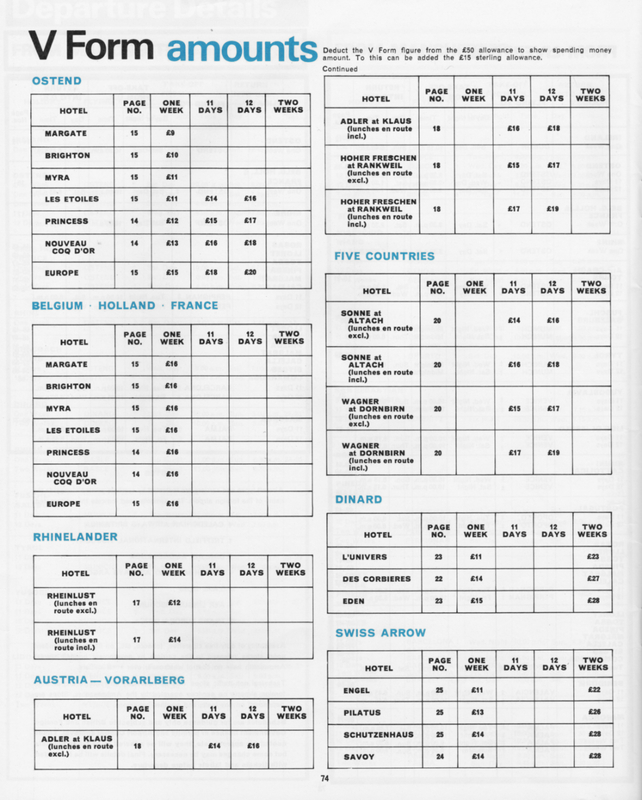 The operation of the holiday flights in this brochure are, as always, governed by and subject to A.T.L.B. licence or M.O.A. permit. 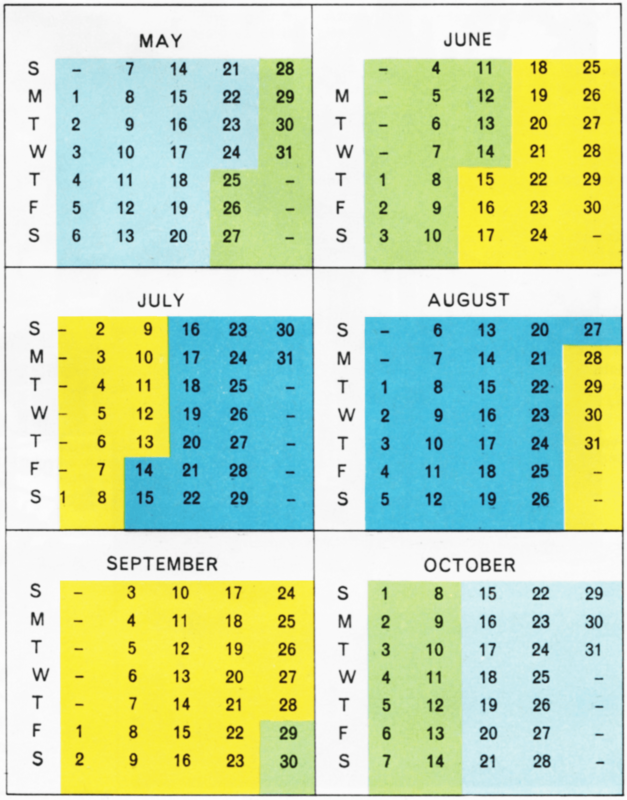 This calendar is an easy coloured reference to variations in seasonal charges. With it you quickly find the lower prices, check your dates, reduce your holiday budget, and go away with money to spare. A good holiday is made better by reduced costs. The further from peak you travel, the better for your pocket—not only this, but crowds are fewer, hotels can give better service, roads and airports are less busy and holidays can be more pleasant. To go before or after the crowds is by far the best — best price advantage and greater hotel availability. Top value, nevertheless, whenever you decide to go. A passenger under 21 is required to produce a note of consent to travel signed by parent or guardian if that parent or guardian is not accompanying the minor. The Holidays in this brochure commence on take-off in the aircraft from the U.K. (and not before) and terminate on touch-down on return to the U.K. The inclusive costs stated are limited to the holiday period in between. To clarify before booking, we emphasise that an air holiday described as 8 days (one week), 11 days, 12 days, or 15 days (two weeks) for purposes of tour titling and definition in this brochure, is offered and sold by us to indicate the 1st day as being the day or night of departure from the U.K. Conversely, the 8th, 11th, 12th, or 15th day is intended to be, and sold as, the day or night of return into the U.K. Specific seats are not reservable, instead passengers optionally move round in strict rotation so offering maximum advantage to all. Your Courier or Representative may not necessarily be staying at your hotel. He or she will, however, visit your hotel approx. once each week. You will be advised where contact can be made in the interim — this is usually at the headquarters hotel in any centre. If you should need to write to us, please do so through your travel agent if booked by him originally. If a direct booking with Arrowsmith, please do not address your letter to any specific officer or official of the Company. He or she may be absent on duty or on visits abroad and your letter could remain unopened awaiting return; delay could thus be caused in a reply. Our mail is daily a heavy one, some delay in a reply could occur naturally; we do our best to deal with all letters, replying as received in date of receipt order. It is right you should know where you stand if you have to cancelThe basic condition of booking any holiday is that on cancellation the deposit is forfeited. What is more serious is that if the places remain empty, there will be substantial charges for empty air and/or coach seats, unused hotel accommodation, etc. These charges are the entire responsibility of the cancelling client and under the contract terms are legally chargeable to the client. following cancellation consequent upon death, illness or injury of the insured, travelling companion, specified relations or business associates. LUGGAGE A PERSONAL MONEY – Up to £200 cover per person. MEDICAL A OTHER EXPENSES – Up to £250 cover per person. PERSONAL ACCIDENT- Up to £1,000 cover per person. YOU HAVE NOTHING TO DO BUT ADD THIS £1 PER HEAD TO YOUR DEPOSIT, AND YOU ARE COVERED IMMEDIATELY. 1. All persons over 75 years of age. 3. Pre-existing illness or infirmity. The general insurance particulars given above and statements made are subject to the Policy and its conditions as set out in the policy by the Insurance Company. Fullest policy conditions and details are freely available on request. What is the £50 allowance? The recorded amount the Government permits you to spend abroad in 1967. What is the V Form? Merely the name given to the form which the banks and travel industry use to control and execute the Government regulations. From Arrowsmith, or from any bank, or from any travel agent. It is quite free of charge. What do I do with it ? It has merely to be stamped and authorised by a bank, then surrendered to Arrowsmith. There is no charge for this service. No. You can also take abroad with you £15 in sterling notes additional to your foreign currency or Travellers’ Cheques. This £15 can be spent abroad if desired. What then is the V Form amount ? The amount Arrowsmith will send abroad to pay for certain costs including accommodation, food, salaries, services, etc., which we will incur in arranging your holiday. Appropriate V Form amounts are clearly indicated on pages 74 to 77. Mr. Smith chooses his holiday. Let us say the one he chooses costs £30… this is all he will pay to Arrowsmith. His only other payment will be to a bank purchasing Travellers Cheques or foreign currency to use as spending money abroad. On pages 74 to 77 is a table of V Form amounts — Mr. Smith looks at his holiday and hotel and notes the V Form figure. Let us say this is £20 for the holiday he has chosen. He then gets a V Form from Arrowsmith, detailing the V Form amount, takes it to the bank, they stamp and authorise it. They also enter the figure on his passport. Mr. Smith pays nothing for this — no money exchanges hands for this process. After this, the V Form is surrendered to Arrowsmith direct or through his travel agent. In spite of the regulations you may find you can take as much spending money as usual anyway. Competitive ARROWSMITH prices permit it. Realistic V Form amounts encourage it. When the time for balance payment comes, Mr. Smith pays the balance amount due as usual, and if he wishes to take spending money abroad, goes to the bank of his choice, taking his passport on which was entered the V Form figure. This figure deducted from the figure of £50 leaves the maximum amount of Travellers Cheques or foreign currency he can finally purchase, which, in this example would have been £30 for spending money. In addition to the above he can of course take £15 in sterling. Harry Bowden-Smith (1918-2003) founded Arrowsmith Tours in 1945 and led the company through to it becoming part of Laker in the late 1960s and part of Greenall Whitley after Laker's collapse. The company later became First Choice and is now part of Tui.